You are here: Abbeyrose Foundation / Healthy Dog Blog / Rabies Vaccine – What are the Most Common Short-Term Adverse Events? Rabies Vaccine – What are the Most Common Short-Term Adverse Events? Adverse events to the rabies vaccine are probably more common than you think. 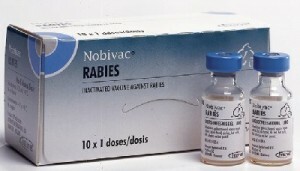 An article in the Journal of the American Veterinary Medical Association summarized reported adverse events for rabies vaccine given to dogs between April 1 2004 and March 31, 2007. A total of 217 adverse event reports were submitted during this time, but remember, these are just the adverse events that were reported and therefore only a fraction of those that actually occurred. All of the reported events appear to be short-term events, or those that occurred immediately after of within a day or so of vaccine administration. Long-term adverse events leading to chronic health conditions were not included in this review. The percentages reported in the paper are the number of each adverse event divided by the total number of adverse events and DO NOT reflect the incidence in all vaccinated dogs. So as not to be misleading, I will not report those numbers here. If you are interested in seeing them, they can be found in the original publication (https://admin.avma.org/News/Journals/Collections/Documents/javma_232_7_1000.pdf ). The only value of the percentage reported by the authors is to show the relative frequency of each type of event. The next time your dog receives the rabies vaccine, look for these types of reactions and report them to your vet if they occur. They should also be reported to federal agencies (eg, the USDA Center for Veterinary Biologics http://www.aphis.usda.gov/wps/portal/banner/help?1dmy&urile=wcm%3Apath%3A/APHIS_Content_Library/SA_Our_Focus/SA_Animal_Health/SA_Vet_Biologics/SA-Adverse_Events ) and the vaccine manufacturer. If reported to the manufacturer only, the report may not be passed on to federal regulatory agencies. 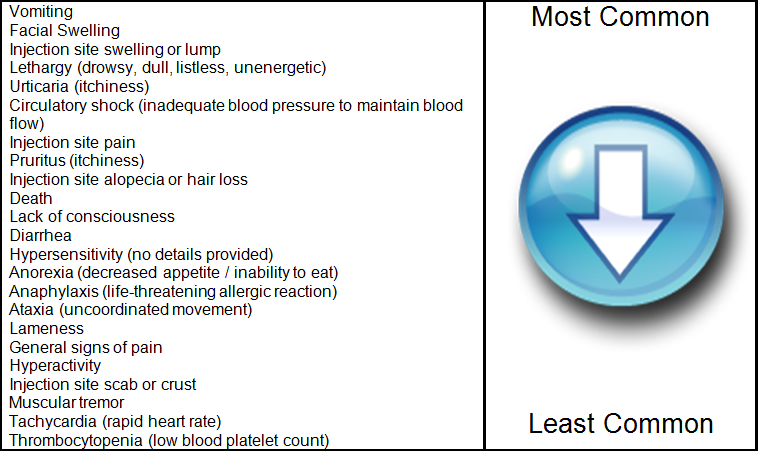 The most commonly reported adverse event are shown here in decreasing order. Also of note, the article reported that 2 rabies vaccinated dogs developed confirmed rabies during this period. Other studies have also reported failure of the rabies vaccine, but the failure rate is unknown. WARNING – US Life Expectancy Declines! When Are Identical Twins Not Identical? What makes a healthy dog? More than good genes are needed for a dog to reach his highest potential. It takes feeding a species-appropriate diet, minimizing exposure to environmental toxins and unnecessary medications, and plenty of exercise and love. We will explore these issues and more in the HealthyDogBlog. The Healthy Dog Blog is written by the Abbeyrose Foundation’s Executive Director Mary Duafala. Mary, a medical writer and holistic and integrative health care advocate, holds certificates of certification in a variety of holistic modalities. 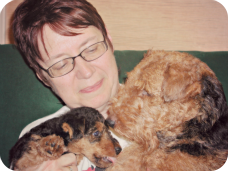 She has been breeding welsh terriers since 1993 and following holistic rearing principles much of that time. Mary has shown in her own breeding program that dogs reared holistically (ie, fed a raw whole foods diet and minimally vaccinated) live on average 3 years longer than their traditionally-reared littermates. For questions or comments, please contact mary@abbeyrosefoundation.org.